Click on all images for a larger view. 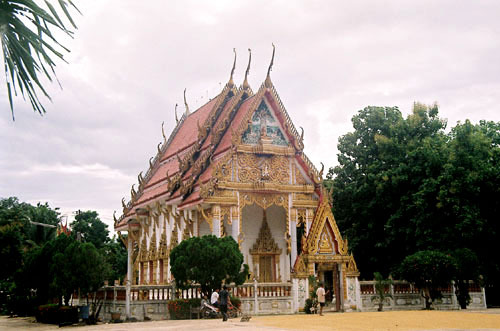 Wat Mongkonsathit is located next to the Ping River in the tranquil village of Bangta-nagai. 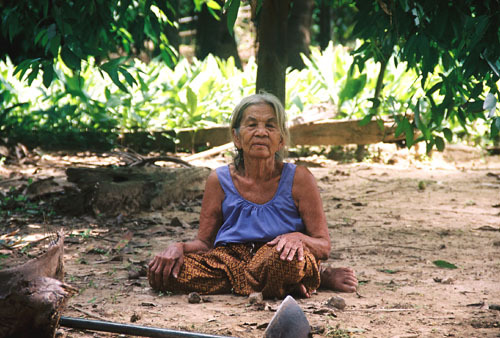 The name (mongkon) means "good things", and (sathit) means "stay". So, Wat Mangkonsathit is the place where all good things stay. 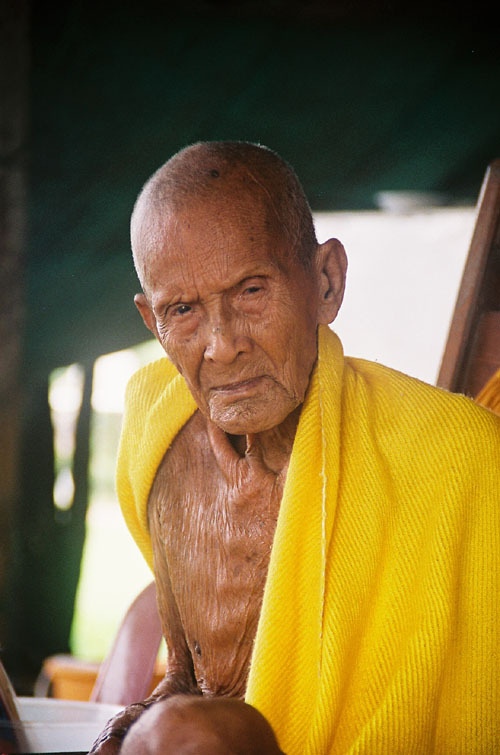 The current abbott is Prakru Niti-tumrat who is now 90 years old. 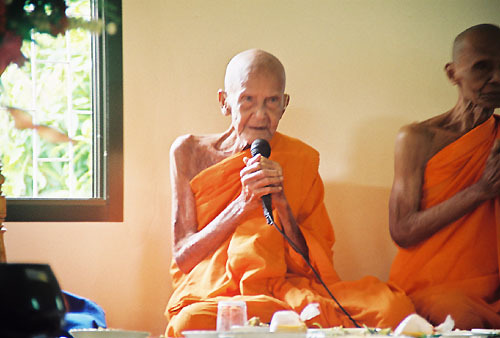 The abbott before Pra Niti was the venerated monk Luang Phao To. Unfortunately there are no documents conveying the history of the temple. What history does exist has been passed down by the monks from oral tradition. According to one old story during the time when the Burmese army destroyed Ayutthaya in 1776 one of the Buddha statues was saved from Ayutthaya and put on a raft in the river. Several monks who found the Buddha on the raft brought it back up the Chao Praya then the Ping River and finally placed it at Wat Mongkonsathit giving the name of the temple it's meaning of where all good things must stay. 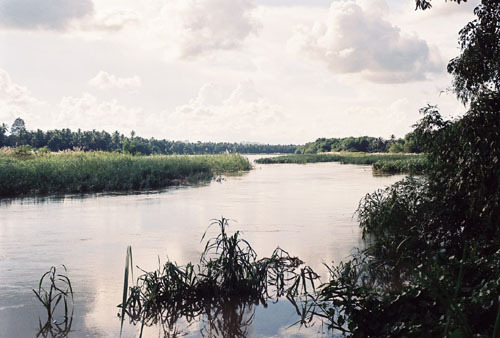 When the East India Company transported teak wood logs down the Ping River from the north the loggers would stop near Wat Maongkongsathit which eventually led to the growth of the village of Bangta-nagai. Charoen, a computer teacher at the Wat Mongkonsathit School, helped me in translating old stone inscriptions on the temple walls as well as writing out questions for Prakru Niti-tumrat to answer since he has lost his hearing. Niti, as he is called, has a deep penetrating look as if has full realization of what our purpose on this earth is all about. 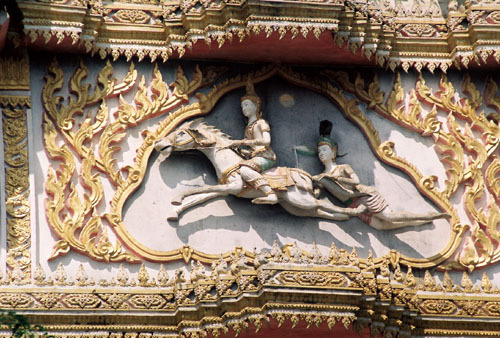 There were two monks who were responsible for the way Wat Mongkonsathit looks today. 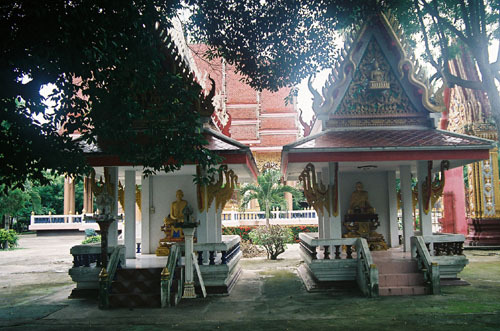 A small sanctuary of two shrines was built to honor the two monks who made significant architectural contributions to Wat Mongkonsathit. Housed In the left shrine is Luang Pho Ngoen who renovated and expaned the temple and villages before he moved north to a temple in Pritichit. Housed in the right shrine is Luang Pho Yim (Phayung Thavorn Thammo ) who was born in Bangta-nagai and became a monk in Bangkok. He studied pali scriptures in Bangkok until he earned his certificate and then returned to Wat Mongkonsathit to renovate the temple and make it look as it does today. 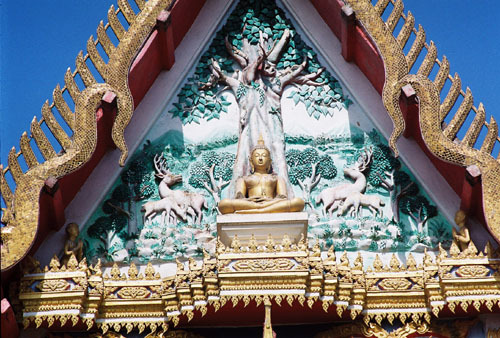 The Viharn, which is directly behind the two enshrined monks, was built for the famous monk Luang Pho To. 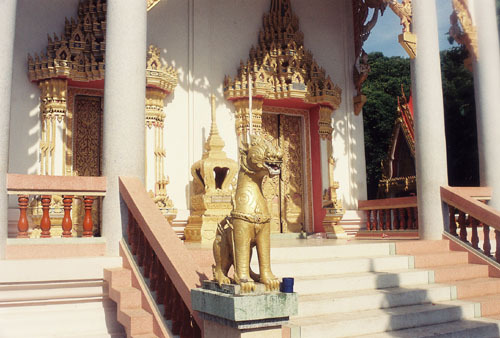 The Viharn was built by Mr. Amorn, with the financial support of Mrs Naiyana Lawasutanan for Luang Pho To. Luang Pho To was the Abbot before Prakru Niti-tumrat. 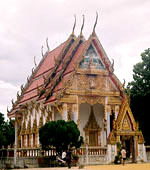 The main ordination hall (Ubosot) was built by Luang Pho Phra Maha Phayung who used to study at Wat Trai Mit in Bangkok. People in Bangkok respected Luang Pho Phra Maha Phayung and gave him money to build the Ubosot at Wat Mongkonsathit. 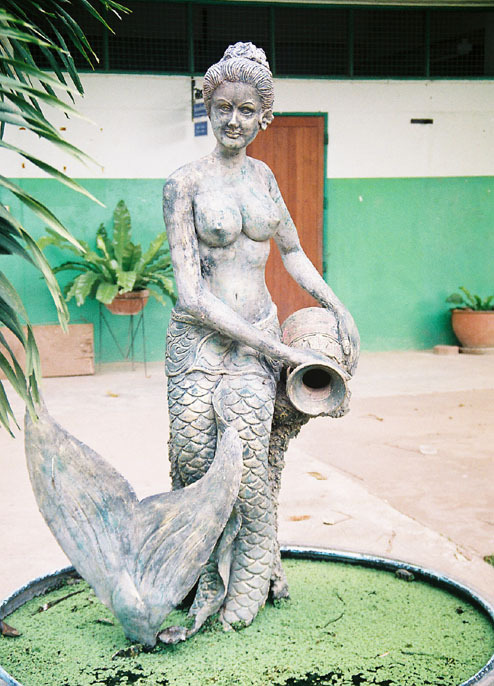 In the central court yard of the temple grounds there is a new bronze statue of a mermaid holding a water pitcher in the pouring position symbolizing the flowing waters of the Ping River that helped bring the Buddha statue and the villagers to rest at Wat Mongkonsathit. 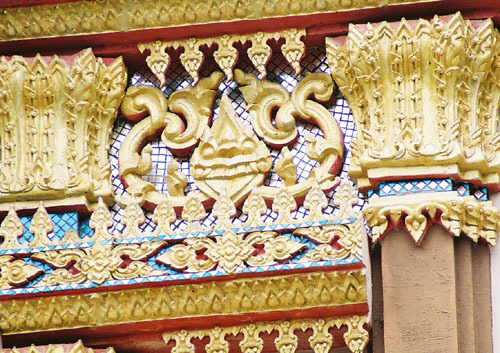 As you look more closely at all the carvings on the temples at Wat Mongkonsathit it slowly becomes evident how the builders incorporated the life of the Buddha as well as the history of the Hindus gods into the architecture. But, before I talk about those carvings I want to start my story with the lives of the villagers who live in Bangta-nagai. Mornings are the best time to take a walk along the Ping River. The air smells fresh and the sun is not hot because it's just beginning to rise in the eastern sky. 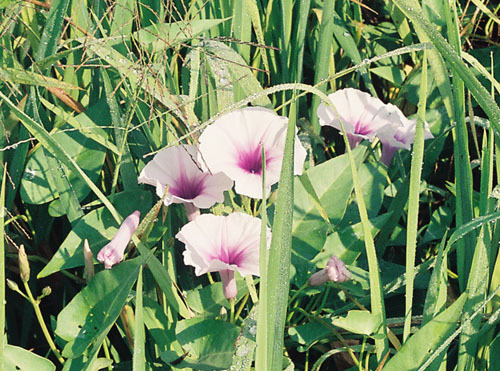 All the purple morning glory's and yellow buttercups are in full bloom, the birds seem excited as they greet the day with a symphony of calls as they dart every which way among the deep green foliage and the lizards skitter across the road and disappear under the leaves. The soil is still wet from a late evening rain and the moist ground exudes a deep earthy aroma as the day begins to heat the banks of the Ping River. The smell of all the exotic flowers fills the air with strange sweet scents mixed with musky odors emerging from the damp evening leaves. It's very serene and quiet and the rest of the modern world seems to not exist at all. It's very peaceful, and my thoughts would never be disturbed by any loud noise. Only the soft flowing river could be heard on its way south carrying broken trees and logs and perhaps a sudden shrill call from one of the birds. Looking at the river is a perfect meditative past time as you can concentrate on the endless flow of water as if it were your thoughts that disappeared into the small eddies and whirl pools always leaving behind the river which never changed it's quiet and peacefull presence of flowing endlessly. 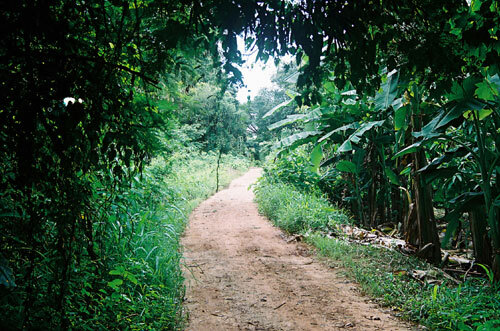 As you walk down the small red dirt road to the temple it's almost impossible to see very far down the road because of the big banana leaves, and arching coconut palms creating a tunnel of iridescent greens and tropical silhouettes. 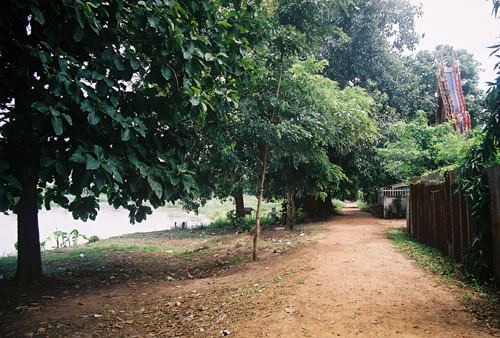 The red dirt road is directly next to the Ping River, and the combination of the river, and all the varieties of green foliage makes for a very magical journey on the way to Wat Mongkonsathit. I have been making this pilgrimage walk every weekend for over three years as the village house is very close to the temple. The journey always has some small difference to offer along the way whether it be the clouds in the sky or buffalo grazing on the grass. It's extremely quiet and you would never know of any strife happening in the world amidst the total serenity along the Ping River. 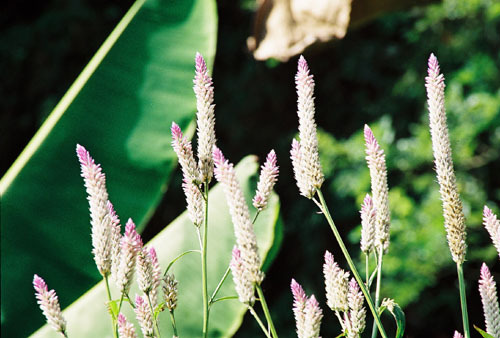 Everywhere you look there is a small garden of plants or small trees being tended to by the villagers who know how to till the rich soil, grow their crops, and sustain their way of life day after day. With such an abundance of soil and water from the rain and river the villagers know they will always be rewarded with whatever they grow. If you stop to listen you will be able to hear the slow scrapping of a hoe on the top soil digging up weeds or preparing for another planting. Tending the plants is a daily activity and if you look very carefully and deeply into the foliage you will always see a villager tending the land. 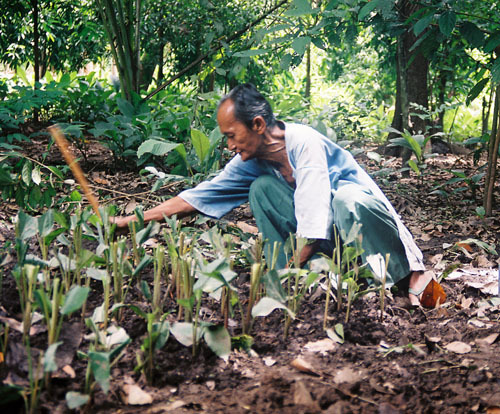 Village farming has been going on for generations unchanged even to this day. The villagers are always kind and friendly when you meet them even though they are surprised to see a foreigner. However, with a few friendly hand gestures and a little coaxing they will smile and wave back. 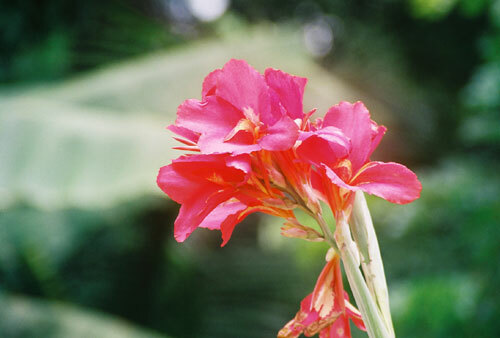 I always give them a copy of a photograph when I develop my film. 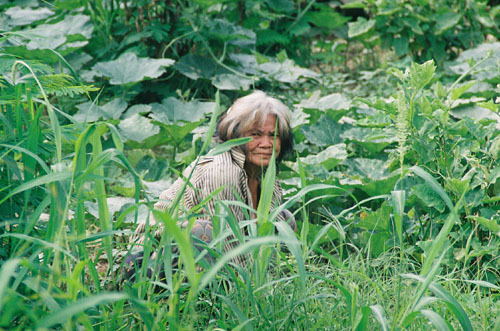 The villagers live among the trees and plants and are very removed from the modern world of the 21st century. They peer out of their world with an air of curiosity and perplexity. 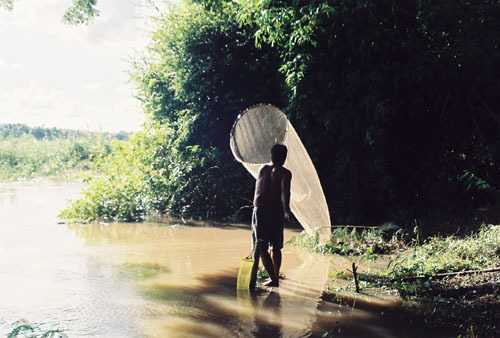 The villagers live solely from what they can grow on the land and catch in the river. On my early morning walks I will always see the villagers doing their chores. By now they are accustomed to seeing me and we always exchange smiles. 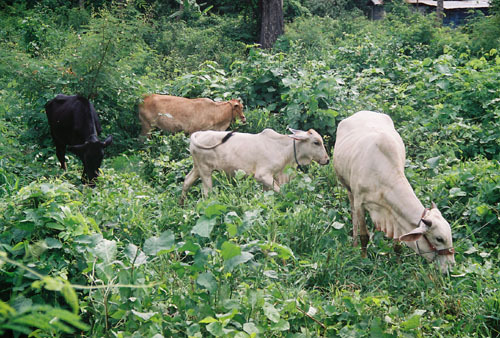 The one outstanding feature is that the villagers live very close to the land, which is their sustenance and they are very much apart of the soil they live on. I would sit with them, and feel their attachement to the land and realize that the farming community of Bangta-nagai has been an on going way of life for generations. Next to the dirt road flows the Ping River which has cut its way next to the village and sits lazily along the river banks. 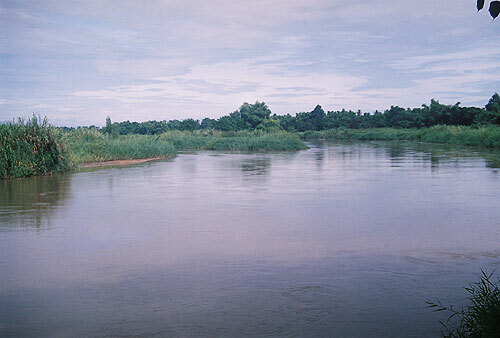 The river provides swimming, a place to wash and a place to hunt for fish and other edibles which only the villagers know how to find to sustain their land based lifestyle. Again, if you look very carefully into the river you will most likely find a villager with a net and long knife prowling for fish under the tall river grass or on the sandy bottom. 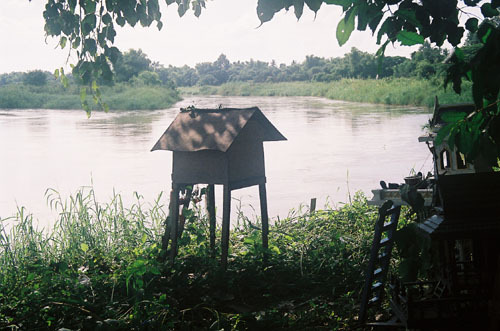 Hand made rafts can also be found tied to fallen trees waiting for the next fish hunt down the southern flowing Ping River forming the head of the Chao Praya River in Nakhon Sawan. 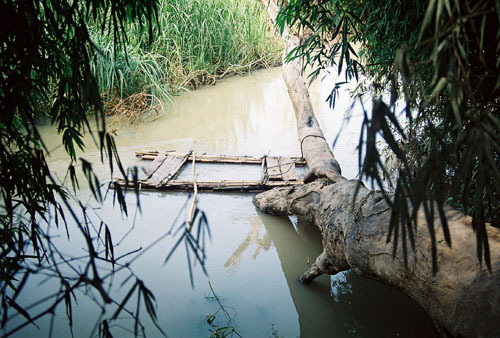 The river is the constant source of life as it is used by the villagers for their rice patty's and orange groves. Ancient trees still line the banks of the Ping River giving a vry old atmosphere to the journey to Wat Mongkonsathit. In the many fields and farm plots you will always find children playing, and so too you can find my daughter, "Nanteta", playing but also learning which plants are edible or not edible. "Gada", my daughter's nickname, watches her mother and other villagers picking roots and wild plants to learn early survival skills past down by previous generations; a skill lost to the urban populations. 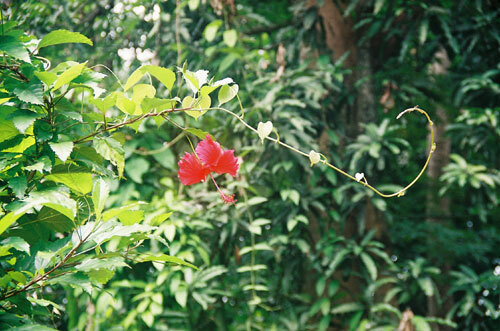 The greenery seems endless as it fills every part of the land that is constantly drenched by tropical rains in the rainy season. Finally, as you walk a little further down the dirt road the first signs of the temple can be seen poking out of all the trees and vines. 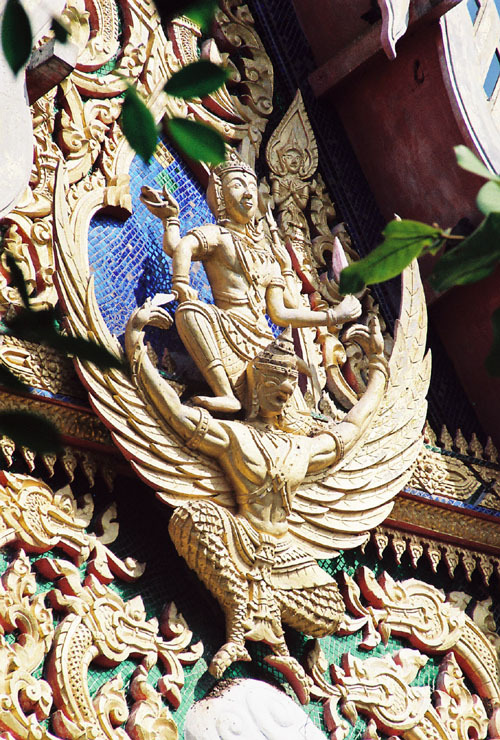 The western gate into the temple grounds is topped by a golden spire adorned with a celestial devotee with palms together and raised in the traditional wai prayer gesture honoring all who pass through the divine portal. 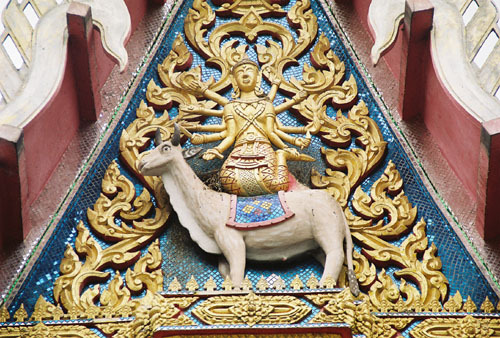 Every pinnacle of the temple is adorned with a mythological carving symbolizing the ancient stories that have been passed down over the millennia or a beautiful mural depicting the life of the Buddha. The ten armed Shiva can be found sitting on his vehicle Nandin the bull, a flying celestial deity silhouetted against the dark velvet depths of the temple roof, or Vishnu sitting on his vehicle Garuda as he stands on the cosmic golden egg of the universe. There are many more deities as well all carved beautifully around the temple. Finally, the majestic and ever peaceful Buddha can be seen meditating under the bodi tree with all the animals gathered around his serene presence as he greets the rising sun on top of the Ubosot. 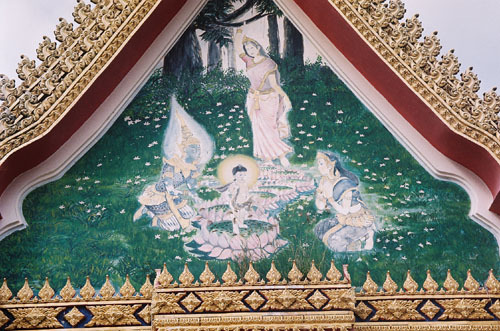 The serpent king can be found in his deep blue waters symbolized by hundreds of shimmering blue mirror tiles as he protects the Buddha from a pending storm on top of the Viharn behind the Ubosot. The entire temple is an encoded tribute to the ancient memories of the birth of humanity from the great void of the universe during the time of the great sleep of Vishnu. Buddha was an avatar and a teacher of the ancient wisdom which made it possible for humankind to know of the glorious heavens where all the gods came from. It's here at Wat Monkonsathit, in the village of Bangta-nagai, next to the Ping River where spiritual guidance and education is given to all the families from generation to generation as they pass their time here on earth. The monks make their alms walks in the early hours of the morning while the villagers wait on the road side to give them food for the day. But even in this remote village in central Thailand it's almost, if not, impossible for the villagers to escape the ways of the modern world with all its machinery and imposed obligations of a monthly payment for something. But even with all the T.V. soap operas extolling modern day living in Thailand or around the world you can still find within the heart of the Thai village a very ancient way of life. Respect for the Buddha holds together the moral and spiritual foundation of the Thai villagers as well as many Thais living in the Bangkok and other urban centers. Thailand is very ancient, but it has found a way to integrate it's ancient traditions into the modern world as difficult as that is becoming. It is this reality of the present combined with an uncertain future which my family faces. 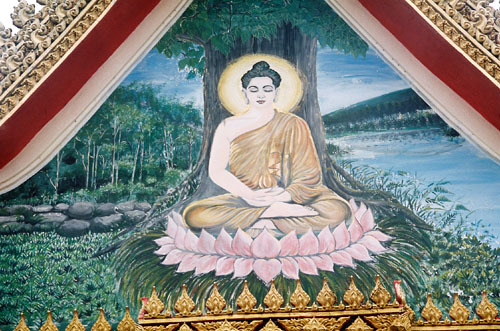 However, the moral teachings given to all the villagers by the monks at Wat Mongkonsathit, as well as all the wats throughout Thailand, ultimately binds people into following the greater good and path to enlightenment. On July 22, 2005, it was a national holiday in Thailand called Kao Pansa Day (the entering period). This is the day all the monks retreat to their respective temples for 3 months. Historically this was the last time the Buddha gave his teachings to his devotees before he left his body. 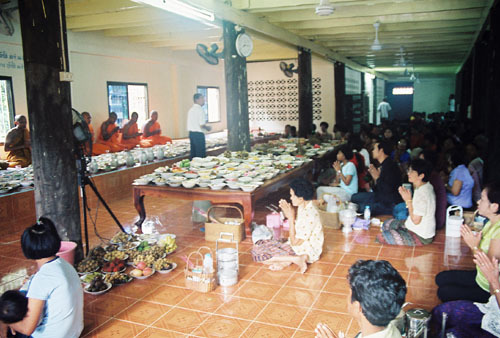 The villagers prepare abundant amounts of food to help the monks in their retreat. The ceremony begins early in the morning and all the villagers present their food and gifts and in return receive blessings, chants, and readings from the old scriptures by Prakru Niti-tumrat who is 90 years old. Flowers adorn the tables, and one by one the elder monks from the temple receive all the villagers and bless all their food. This ritual has been going on for over 800 years, and the text from which Prakru Niti-tumrat reads from is the same text the monks read from so long ago. There is pious humility and genuine caring for all that which the monks symbolize. It's a way of life for the monastic sect of the Theravedic Buddhists. There is no doubt whatsoever in all the villager's minds that the Buddha is their moral teacher. 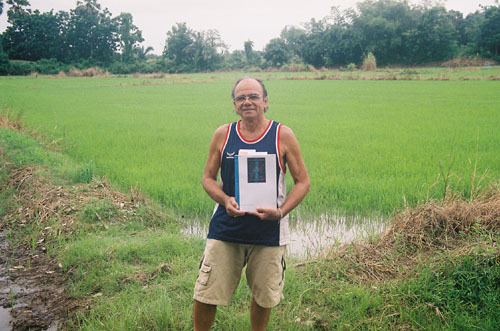 As I stand next to the village rice paddy in Bangta-nagai, holding a copy of the book, "The Architecture of the Spirit" by Pete Stewart of Scotland, I reflect on the ordination ceremony and that special moment when Prakru Niti-tumrat read the ancient Pali scriptures and watched all the villagers paying their respects with unfailing devotion. Willard holding "The Architecture of the Spirit"
A time long ago people's attention to the source of the sacred teachings was integrated into every aspect of the their lives through daily devotional routines established by the monks and Brahmin priests. But even though the passage of time has changed the world dramatically, those teachings which were so faithfully followed ages ago are still the basis for Buddhists all over SE Asia today. 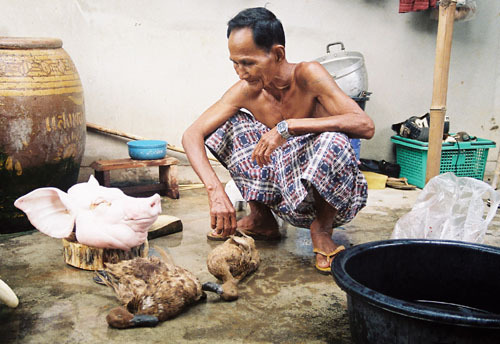 The blending of cultures from Asia, India, and SE Asia still forms a tapestry of devotional lifestyles. Religious events are honored with holidays giving the people the opportunity and time to continually pay their respects to ancient beliefs still in practice today. Whether it is the ancient Pali Canon (Tipitaka) of the Theravedic Buddhists or the Sanskrit forming the ancient Vedic texts of India the message is still the same. And that message is that the enlightened state of mind is available in this life time through making merit, attending devotional rituals, doing meditation and respecting the divine deities who created the universe and gave birth to our human form so that we may witness the splendor of the heavens. "The Architecture of the Sprit" by Pete Stewart of Scotland.